Taxis between Phnom Penh and Siem Reap usually cost between $65 to $100, but are more expensive on Cambodian holidays. Private taxis can reserved in advance online (at surprisingly reasonable rates). The trip takes between 4 and 6 hours depending on traffic and how often you need to stop. If you reserve online, you will get a large SUV taxi, usually a very comfortable Lexus 4×4. If you reserve online, you’ll pay in advance by credit card and don’t have to deal with last-minute price changes by the driver. If you book through a guesthouse or travel agent, the cars will almost always Toyota Camrys and can fit 4 passengers as long as they don’t have a lot of luggage. The trunks are not huge, so if you’ve got more than one piece per person, it’s going to be a tight squeeze. Guesthouses and travel agents will charge a commission. Make sure to confirm the price with the drive before you set off, as misunderstandings are common (and frustrating). Expect your taxi driver to stop multiple times to pick up and drop off packages along the way. If you are paying on the high end of the scale, it’s fair to ask (in advance) that they do not make extra stops. If you are catching a taxi directly from the airport, expect to pay slightly more. 4-6 hours. It is also possible to get mini-vans taxis between Phnom Penh and Siem Reap. They cost between $100 and $200 and can carry up to 15 passengers. If you’ve got more than a couple people and want to give the bus a miss, this is a good option. The vans are usually new and clean, but ask to make sure the one you hire has seat belts. You can hire mini-van taxis in Phnom Penh next to the Landscape Hotel across from the Cambodiana Hotel on Sisoqwath Quay. Van drivers gather there and you can negotiate your own price. You can also book a mini-van online, which is usually less of a headache. The road between Phnom Penh and Siem Reap offers a glimpse of Cambodian country life, as it barrels past rice paddies, traditional wooden houses, and water buffalo and cows lazily grazing on the side of the road. The views are best appreciated from a full-size bus, as the mini-buses are more crowded and have smaller windows. If you get carsick, the bus is a better option as it’s a bit slower and significantly less bumpy. 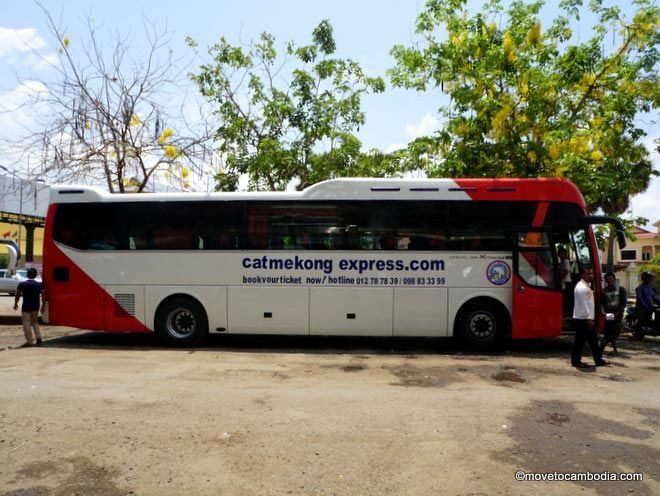 There are dozens of bus companies offering service between Siem Reap and Phnom Penh. Many are old, overcrowded, make dozens of stops, and break down often (but are cheap, running around $6 or $7). The more expensive ones offer a much smoother ride and extra amenities. The most popular amongst expats is Giant Ibis, offer WiFi and power outlets on board. 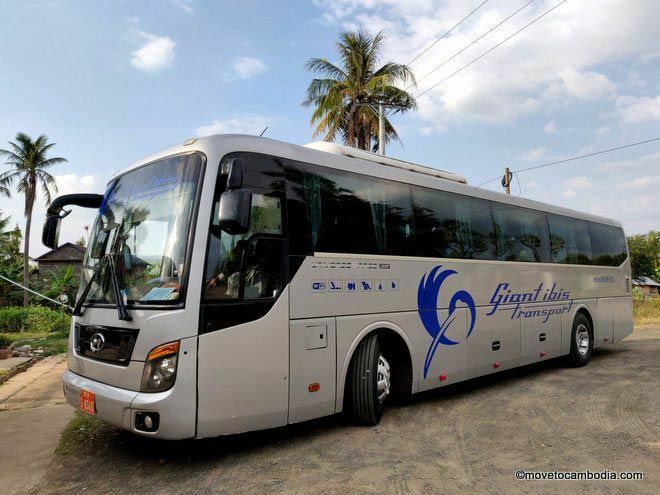 Read our review of Giant Ibis buses for more detailed info. Giant Ibis also has a night bus between Phnom Penh and Siem Reap that runs in both directions. Check out our detailed review of the Giant Ibis night bus. Tickets cost $15, and you can book online and select your seat in advance. The trip takes between 5 and 6 hours. 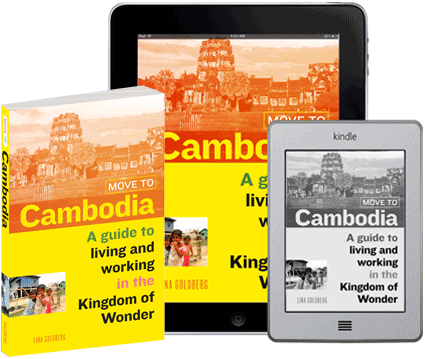 Phnom Penh to Siem Reap: 8:45 a.m., 9:45 a.m., 12:30 p.m., 11 p.m., 11:30 p.m.
Siem Reap to Phnom Penh: 8:45 a.m., 9:45 a.m., 12:30 p.m., 11 p.m., 11:30 p.m.
Popular Mekong Express are known for their safety record and have recently gotten a new fleet of full-size buses, although if they don’t get enough bookings you may end up on a mini-bus. Tickets cost $12 and you can book tickets and select your seat online for a small service fee. The trip takes between 5 and 6 hours. 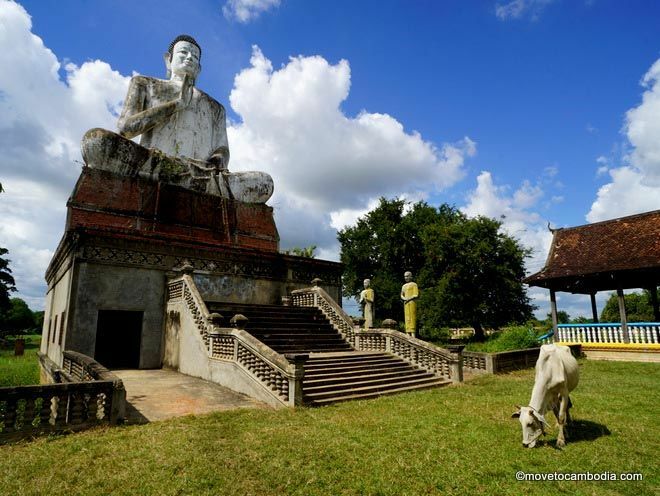 Read our full review of this trip on Mekong Express. Expats in the know—at least the ones who are not prone to car sickness—travel by mini-bus, as the trip is significantly shorter than by bus. There are many, many mini bus companies covering this route, but we’ve personally vetted the ones below. Mini-buses are the fastest way to get from Phnom Penh to Siem Reap by road. Cambodia Post VIP Van is my current favorite mini-bus from Phnom Penh to Siem Reap. This government-owned transport company runs new (and very comfortable) Toyota HiAce vans between Phnom Penh and Siem Reap. They only carry 13 passengers at a time, so it’s less claustrophobic than other companies. The trip takes about 5.5 hours with two stops and they drive cautiously—they even have a sign on the back of the van saying “How’s my driving?” with a phone number to call. Tickets cost $9. Read our full review of Cambodia Post VIP Van. Phnom Penh to Siem Reap: 7 a.m., 8 a.m., 9:30 a.m., 2 p.m.
Siem Reap to Phnom Penh: 7:30 a.m., 9 a.m., 11 a.m., 2 p.m.
Larryta Express runs a fleet of 15-passenger Ford Transit Vans nine times a day between Siem Reap and Phnom Penh. The buses are new and clean. The drivers drive fast, but not terrifyingly and trip takes a little under 5.5 hours, including two stops. Because of the regular departures, you don’t need to purchase tickets more than a day in advance. Tickets cost $9 for Cambodians and $11 for foreigners. Read our full review of Larryta Express. Phnom Penh to Siem Reap: 6:30 a.m., 8:15 a.m., 8:30 a.m., 9 a.m., 9:30 a.m., 10 a.m., 10:30 a.m., 11 a.m., 1:30 p.m., 2:30 p.m., 3:30 p.m., 4 p.m., 4:30 p.m.
Siem Reap to Phnom Penh: 7 a.m., 8:30 a.m., 9 a.m., 10 a.m., 11 a.m., 12:30 p.m., 1:30 p.m., 2:30 p.m., 3 p.m., 4:30 p.m.
Seila Angkor is popular mini-bus company that does the Phnom Penh to Siem Reap route with 18 departures every day. The drivers occasionally take some hair-raising liberties, and drive faster than I’m comfortable with, but most of the time the trip takes 5.5 hours and the drivers go at a reasonable pace. Seila Angkor run 16-seat Ford Transit vans, and you can reserve seats by number. Tickets cost $9 for Cambodians and $11 for foreigners. Read our full review of Seila Angkor mini bus. Phnom Penh to Siem Reap: 6:30 a.m., 7 a.m., 7:30 a.m., 8 a.m., 8:30 a.m., 9 a.m., 9:30 a.m., 10 a.m., 10:30 a.m., 11:30 a.m., 12:45 p.m., 1:30 p.m., 2 p.m., 2:30 p.m., 3 p.m., 4 p.m., 5 p.m., 6 p.m., and 11 p.m.
Siem Reap to Phnom Penh: 6:30 a.m., 7 a.m., 7:30 a.m., 8 a.m., 8:30 a.m., 9 a.m., 9:30 a.m., 10 a.m., 10:30 a.m., 11:30 a.m., 12:45 p.m., 1:30 p.m., 2 p.m., 3 p.m., 4 p.m., 5 p.m., and 11 p.m.
You can book tickets for Cambodia VIP Van, Larryta Express, Seila Angkor and many other mini-bus companies on BookMeBus. If you use an international credit card there’s a book fee of less than $1 and you can reserve a seat at the time of booking. Cambodia Bayon Airlines flies Chinese MA60 turboprop planes. Be ready for a loud ride. There are now three airlines operating daily flights between Siem Reap and Phnom Penh. This is the fastest (and most expensive) way to travel; if you’re short on time, flying is a good option because it only takes between 45 and 60 minutes (plus of course the hour at the airport). However, and there’s always a caveat, all of the Cambodia domestic flights are unreliable and you may end up getting delayed by several hours. Cambodia Angkor Air is the national carrier and the most expensive option. Flights can be booked online or through any travel agent. The cost varies, but is usually between $60 and $100 for a one way ticket. Occasionally travel agents can get better deals, so it’s worth asking. Read our full review of Cambodia Angkor Air with booking tips. There are also several new airlines flying from Phnom Penh to Siem Reap (and vice-versa) once daily with prices as low as $50 return. We have a entire blog post comparing all of the Phnom Penh to Siem Reap flights if you’re thinking of flying. Another option is a shared taxi. You can get shared taxis from the southwest corner of Central Market (Psar Thmei) in Phnom Penh. The cost is approximately $6-12 per person, and the drivers wait until they have enough customers to fill up the taxi like a sardine can. Although the cars are 5-seater Camrys, most will wait for at least seven passengers (plus the driver) before departing. Offer to pay extra to take the front seat, otherwise you’ll be squeezed in with three or four others in the backseat. The journey takes 5-6 hours and is very crowded. Between July and March ferries run between Phnom Penh and Siem Reap (they usually do not run during the dry season when the water levels are low). Most passengers opt for sitting on the top of the boat (so bring sunblock) and watch the countryside go by. Travel is best during the wet season when water levels are high. The boats are, for the most part, not as safe as what you would find at home, and the company who had life jackets has temporarily ceased operations. For that reason, we’re currently not recommending this option. This entry was posted in Transportation, Practicalities, Phnom Penh, Siem Reap and tagged Giant Ibis, Mekong Express, Mey Hong Transport, Cambodia Angkor Air, Cambodia taxi, Seila Angkor, Phnom Penh to Siem Reap, Siem Reap to Phnom Penh, Golden Bayon Express, Bassaka Air, Cambodia Bayon Airlines, Cambodia Post VIP Van, Larryta Express, boat trips, Mekong Explore. Bookmark the permalink. Any idea on Bike renting in Cambodia ? How much safe it is and would you recommend this ?